I didn’t grow up with the Silent Night version of Christmas. Actually, I didn’t grow up with Christmas at all. My parents’ religion didn’t have a sweet, clean, bright idea of how baby Jesus came into the world and how that translated into glittery Christmas ornaments and pop melodies. There are a thousand reasons I have resented my upbringing, but at Christmas I am always surprised by how grateful I am to have inherited a different point of view. The story I heard as a kid involved a political conspiracy from a powerful king, a scared teenage girl, an exhausting journey and a disgusting barn. The story I heard as a kid did not sound like Silent Night. All was not calm and it was not bright. The story I heard was the bleak and harrowing tale of weary travelers trying to believe the crazy thing God told them. I don’t want to sanitize the nativity. I don’t want to Americanize or white-wash the narrative of Middle Eastern people, religious minorities, a brave woman and the birth of her child. Those parts are what make the incarnation of God so important—the dawn of redeeming grace. Our world hurts. Our headlines remind us that powerful people are making decisions that hurt vulnerable and beautiful humans. There are displaced people scattered and shuffled to unfamiliar lands. And what endears me to Christmas is that the nativity is this same human story. Struggle and pain and mud all mixed into the cracks of worn, tired hands. The pristine, fair-haired baby Jesus and his glowing blonde mother set in glazed ceramic—fragile and beautiful and perched on a shelf—is not an image that helps me see hope in my world. 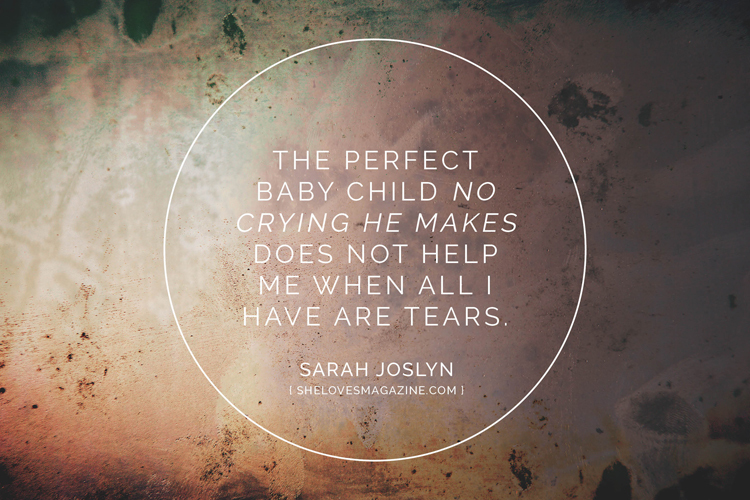 The perfect baby child no crying he makes does not help me when all I have are tears. What causes me to hope is that God incarnate joined humanity in the very worst way. And it is still miraculous. I don’t subscribe to the religion of my childhood—I embrace the Christmas season in all its glory and glitter. I will purchase gifts and string up lights and sing carols with odd theology. My sisters and I will pool our funds and share our Christmas trees and overfeed our whole family. We are irreverent and unapologetic, but we are also very well-loved. We are not afraid to talk about the darkness and aguish, the blood and the tears. And we are not afraid to talk about the light either.